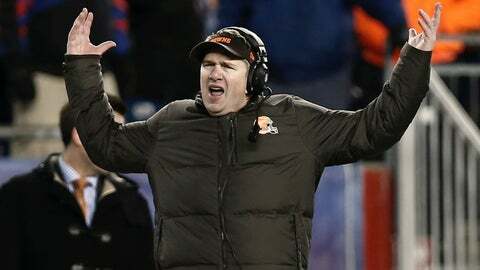 The Browns will enter the final game of the season with a 4-11 record under first-year head coach Rob Chudzinski. BEREA, Ohio (AP) — Even before it started, Browns coach Rob Chudzinski recognized his first season wouldn’t be without challenges. His dream job would require hard work and grueling hours. Maybe more than he bargained for. Turning around a perpetual loser — especially the team closest to his heart — wasn’t going to happen overnight. It never does in Cleveland. There were going to be tough days, and Monday was yet another one. For the sixth straight week, Chudzinski, his dark, sunken eyes showing the season’s wear and tear, was forced to explain what went wrong after the Browns (4-11) lost 24-13 on Sunday to the New York Jets. The latest loss followed a familiar script: get an early lead, give up points late in the first half, break down defensively in the second half and collapse. Chudzinski’s rookie year has been rocky. Still, he’s undaunted by the task. "I understood the challenges that we had," he said. "I know what it takes here, specifically. I think, again, I’ll go back to the plan that we have overall as an organization to establish the type of success long term that we want and that that would take some time to get to. "I know what I signed up for." Chudzinski is keenly aware of the frustration felt by Cleveland fans, who have endured more than their share of losing. The Browns have lost at least 11 games in each of the past six seasons and have 12 double-digit loss seasons since their expansion re-start in 1999. They’ve lost 162 games since `99, tied with Detroit for the most in the NFL. Chudzinski, too, bears the scars of losing. He knows firsthand the pain and suffering that comes with rooting for the Browns. "I grew up as a Browns fan," he said. "I know the frustration, I understand the frustration. I’ve lived it. I can only say that there’s nothing more that I want than for this place to be a winner and for us to turn it around, and we’ll get that done." Chudzinski has plenty of excuses he could use, but he’s not about to trot out any of them. The Browns’ quarterback carousel has spun all season; the team traded running back Trent Richardson and didn’t adequately replace him; and the front office has spent much of the year tinkering with the bottom of the roster. Does part of him want to say, "What did you expect?" 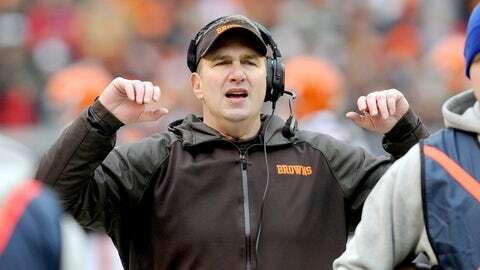 "I don’t think that way," said Chudzinski, Cleveland’s sixth full-time coach since `99. "I don’t function that way. I’ve always felt like whatever situation you’re in, whatever you’re doing, whoever you have, you have to figure out a way to make it work. It’s a puzzle that you have to figure out how you can put that puzzle together. And obviously we haven’t been able to do that this year well enough." A recurring problem for the Browns has been their inability to protect a lead. Cleveland has led at some point in eight of 11 losses, and blown fourth-quarter leads in three of the past four games. The Browns have lost five games in which they’ve entered the fourth quarter tied or with the lead. "We’ve played well coming into games and starting games and have had good starts and started fast, and we haven’t been able to maintain those leads," Chudzinski said. "Each week, it’s for different reasons. So that’s the difficult thing is to pin one thing down. When you can pin it down to one thing, you can fix it. Sometimes you fix one thing and something else pops up." NOTES: Chudzinski said he has reached out to WR Davone Bess, who was placed on the reserve/non-football illness list on Saturday. "He’s going through a family, personal matter, personal issue," Chudzinski said of Bess, who had a disappointing first season with Cleveland. "We’re going to give him all the support we can through this." … Browns NT Phil Taylor and G Jason Pinkston both sustained concussions in Sunday’s loss. The pair joins TE Jordan Cameron, who missed the Jets game with a concussion and is following NFL protocol on head injuries. … Browns CB Joe Haden aggravated a hip injury during the game. … Chudzinski said DBs coach Louie Cioffi will need surgery on his right knee after he was injured on the sideline when Jets quarterback Geno Smith was pushed into the Browns’ bench by Barkevious Mingo.